We got Summer last Thursday. She's so cute and funny. The markings are super on your kitty, Summer. She is outstanding! Collars are not too tight if you can put 2 fingers between the collar and the cat. Yes Cats DO NEED COLLARS> If they sneak out or get ran over or hurt at lease people will know 1: it belongs to some one not a stray and 2: what family to contact if something would happen. My cats all have them and they are indoor cats, but manage to get out when the grand babies are here. 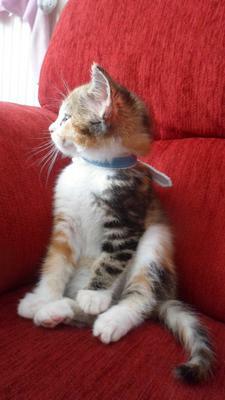 I have a 7 yr old torbie like this. She has an orange tabby left leg and a black tabby right leg. Her face is the same. Just beautiful! So beautiful and sweet, God bless you!!!!!!! She is beautiful and I hope you have many wonderful years together. Summer is beautiful, but the collar detracts from her beauty. Besides, cats don't need collars. Ask Jackson Galaxy from "My Cat From Hell". She is pretty and sweet. She looks like a loving kitten. I'm happy for you all to receive this little baby girl. May God Bless you and Summer and family. Gorgeous calico markings, but her collar looks a little tight. She's a beautiful little girl! So sweet looking. I love her coloring.